One of the regular questions in the weekly FTW Blogger Spotlight is "What is your number one hobby tip?" For the love of god, don't prime your models with black!!! I don't know how this stupid tradition got started, or why it lingers, but it's awful advice. Use white, gray, or brown instead. I use a brown wash over a neutral gray undercoat myself. The brown enhances details without sucking the life out of the colors you paint over it. Many people wonder how I get such a bright look to my army. That's how. He's very passionate about this and for good reason, just look at his army and you'll see what using a color other than black can do. 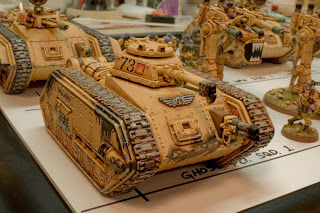 He's even posted a step by step on how he paints his tanks. So, I figured I'd look into this idea a little more. Like everyone else, I've always used black. Maybe it's just the color we all start with, who knows? The Painting Corps asked the questions once, What primer color is best? I'll be honest, using black makes it easy for me. Black always looks like a "shadow"and it makes it easier when you don't have to paint all the way down into all those recessed areas on the model... just leave them black and call it a shadow. But that easieness comes at a cost. When you prime with black, it can take some of the life from your colors or increase the amount of work you have to do to get those bright colors you want back. For some of us, this is acceptable. Just getting our armies painted beyond priming can be a struggle. 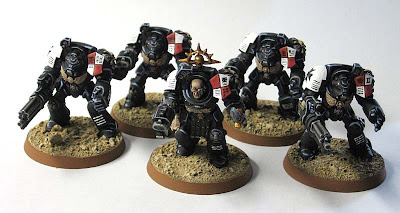 Berks Warhammer 40k has got a great article on doing just that, getting your guys tabletop ready and a follow up artcile on finishing them off. I will say that there are times when black is the color to use. Some paint schemes just lend themselves to using black. Over the past year, I've done a tremendous amount of painting. I've made a conscious effort to use colors other than black when it comes to priming. I first experimented with different colors when I painted my Lustwing army. For these guys, I went with a rich, redish brown color. In the end, it paid off in spades, giving the army a unique color and look on the tabletop. As for those wondering what that redish brown color looks like, it's the color of the trim around the edge of the base. I also kept the primer color as the base color too but that's another post. My next real chance involved 20 Adeptus Custodes. These guys are all gold and using black as a primer would have been a disaster. Fortunately, my Client let me use a dark brown as the primer and basecoat for these guys and they turned out better than I thought they would. When it came time to paint my current Deathwing army, I opted for a light grey primer and basecoat. Of course I tried a completely different painting style as well, but I don't think the army would have looked as good had I started with black primer. I'm working on a Space Hulk commission right now and I'll admit that I was a bit worried at the idea of using something other than black to prime. I know it will make the models look better in the end, but could I pull it off effectively was the question. While I've done it before, it's still out of my comfort zone to some extent. To this, I can only say give it a go. You'll never know until you try it out. The Genestealers don't look half bad so far. Agree 100%. Nearly everything I paint is over white primer. Great color comes from layers. Starting with white lets each layer, no matter how subtle, stand up and add to the finished product. This is an interesting topic. I went with black GW primer to start 'cause that's what was recommended... and available. Now I'm considering browns & greys... but of course, I've still got this mostly full can of black sitting here. Hmmm. Is the difference significant enough to justify a switch? Food for thought. I think that it is a question of technique and color scheme. I'm painting yellow over white now and it is with mixed results. Any mistakes in coverage gets more noticable (black looks like shadow etc) but the colors look different. When I paint my Cygnar I like to use black because the blues work well over that. I saw someone priming black and then spraying white from the light source. Painting with somewhat transparent colors could give kind of a cool effect that way. Been thinking of trying that. Most commonly i Use grey as it provides and excellent neutral base while not overwhelming lighter colours like black does. If i want a particularly vibrant model, or I'm going to use a heavy glazing method I use white. lastly, if I want to try and spend a bit more time on a guy i do use black, gesso, then i use a zenithal blast of white from my airbrush. The army painter (http://www.thearmypainter.com/index.php) now sell a variety of coloured primers which are very useful. But read the instructions carefully or watch the vids on the site because whereas GW sprays say use OVER 30cm, Army Painter sprays are used at LESS THAN 20cm. I usually use black primer. I have however used a grey primer once or twice. I have also used a white primer, then washed with black. The black helps define the details of the mini, without compromising on the brightness of the white primer. I primarily use black, but also white, gray, green, and a slew of the Army Painter colors now (the red is amazing). I also use gesso (black, white, and grey). In priming there is only one rule and its not "don't use black to prime", its use the correct color for the job. Charles: I think you hit the nail on the head. Hopefully, collecting the expertise of guys who have painted for a while will help those of us who are still learning the ins and outs. It never ceases to amaze me, all the tips and tricks out there. I usually prime Grey or White, depending on what I'm doing. I also don't use spray primers. I use Gesso (white) and then add a drop or two of the color I want to build onto. So if I want a reddish primer, I add a drop of Gore Red, etc. I don't think I can ever go back to black. I'd use a dark grey before I use black, I think. Yeah, I'm no master painter but after a few years of painting I've come to similar conclusions. For my Blood Angels I stuck with gray. When I picked up Tyranids I tried out black. The result was countless layers of paint to achieve my color scheme (Kraken). I smartened up and started priming them white and then washing that with devlin mud. It was a quick and dirty solution that achieved nearly the same effect. For my Dark Eldar, however, I am using black, because well, they're mostly black and it lets me apply one thin layer of my off-black base. Maybe I'll try the brown primer for my Homunculus. AS far as I know, regular primers are acrillic based. Recently I got my hands on an enamel car primer for plastic, but still hesitate to use it. There's an old plastic toy detailed enough I found to test it on though. Maybe today even. So, is such a primer worth considering? 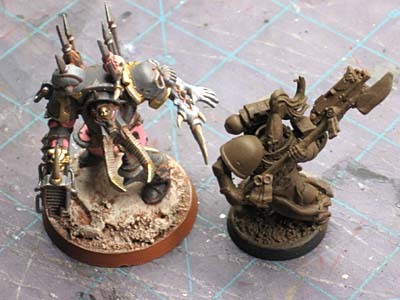 Ron: How would you prime and paint a Dark Angels Space Marine? And one with robes? Aeteros: Absolutely. Try it on a model you're not worried about destroying and see how it works. It may be a wash in the end and turn out horrible or you may have something that works perfectly for you. Mr. Rodriguez: I like the dark look to my models these days. If I were to paint a regular Dark Angels model, I'd prime him black. Then I'd work up through my greens until I had the shade I wanted. I've most likely go the zenithal approach and apply my green selectively to the appropriate places. 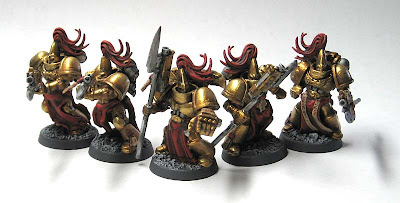 If they had robes on, it would depend on what was more prominent on the model. Is it the robes or the armour? 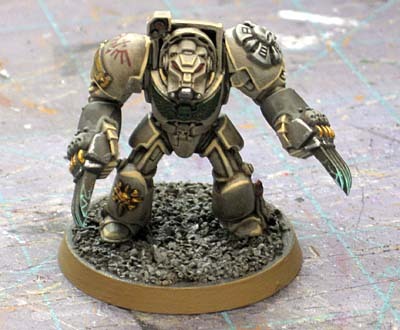 If it's the robes, prime him light grey and then paint the armour separately. The light grey route would allow you to keep your light colors for the robes without having to do 100 layers of paint. If more armour is showing, prime black and then go over the robes separately. You're looking to make it as easy as possible so you choose the larger element to save the most time. For a long time I've used Scorched Brown or similar, not sure if the really is any difference but I've found it really helps the slightly organic approach that I like.